Teresa Rhyne had never considered her life to be inspirational-she always felt she fell more into the "warning to others" category. But, her life changed forever with one sound: AAAARRRROOOOO! 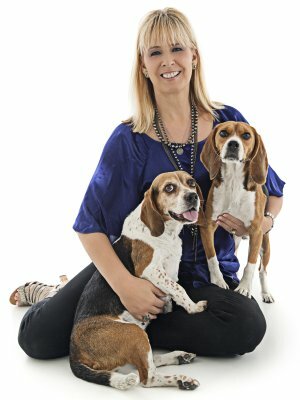 Emitted by a Beagle she later named Seamus, it signaled the beginning of a journey she could never have imagined, one that lead to her becoming a #1 New York Times best-selling author and now a sought-after speaker and motivator. A natural born pessimist, and a lawyer (where cynicism is practically in her job description), Teresa transformed into a reluctant optimist through one unruly dog and two cancer battles. Teresa shares with audiences her unique story of how both her dog and she survived cancer. Her style has the unique combination of tenderness and humor, an occasional howl, and dashes of optimism and inspiration that still surprise her. Audience members find much to relate to in Teresa's story of resilience, tenacity, and a deep (perhaps insane) love for a dog. Following a divorce, Teresa set out to re-start her life. She had a new job, a new home, a newly rescued dog, and soon enough, a new boyfriend. But within a year Seamus the beagle was diagnosed with an aggressive cancer and given less than a year to live, even with treatment. Teresa and Seamus decided to fight the disease together, and the beagle not only survived but thrived well past his deadline. Soon after, Rhyne herself was diagnosed with triple-negative breast cancer. Both battles were long and difficult. But, throughout Rhyne's treatment, Seamus was a four-legged touchstone, his successful battle paving the way for hers and giving her the confidence to persevere. Happily, Rhyne has had no evidence of the disease since that time. Having spoken to breast cancer organizations, women's groups, and even dog rescue groups across the country, Teresa's message of hope and healing and starting over as many times as necessary was one that resonated with many people. Thus, she turned her story into a memoir: the inspiring, uplifting and surprisingly hilarious The Dog Lived (and So Will I). Embraced by both critics and fans, it became a #1 New York Times and international bestseller and has been translated into six languages. Teresa Rhyne is a graduate of the National Speakers Association Academy and has shared her story with audiences throughout the United States and as far away as Barcelona, Spain. Clients have expressed how impressed they were that she was able to discuss such personal matters in a humorous and engaging manner. She has appeared on CNN, CBS, and WGN news segments, had been featured in More, Woman's World, First for Women, Cesar's Way, Breast Cancer Wellness, Suburban Dog and other regional magazines, as well as countless regional and local newspapers. In her sequel memoir, The Dogs Were Rescued (and So Was I), Rhyne details how her current beagles, Daphne and Percival, inspired her to adopt a healthier, more compassionate lifestyle. The Dogs Were Rescued (and So Was I) won the Pat Santi Memorial Friends of Rescue Award from The Dog Writers Association of America. Teresa Rhyne is a lawyer, animal advocate, traveler, inspirational speaker and breast cancer survivor, though definitely not in that order. She splits her time between Riverside and Paso Robles (both in California) where she resides with her partner Chris and their two adorable, spoiled beagles. ​Teresa's presentations have been enjoyed by a variety of audiences including animal lovers, those with an interest in health and well-being, cancer survivors and warriors, writers, readers, women's groups, and corporate customers, and anyone who appreciates an entertaining, humorous and thought provoking talk. Presentations can be customized for your group and pricing can include copies of one or both of Teresa's books for the audience members-a take-away gift sure to please your guests. An entertaining presentation on how Teresa learned to think like an optimist when she most certainly felt like a pessimist. Teresa's beagle Seamus survived cancer against all odds and he was right by her side when she was diagnosed herself. She followed the dog's lead and learned to focus on the "cookies" in life and now she shares that knowledge in a heartfelt and humorous talk. Teresa shares the story of how an unknown writer not only got her memoir published, but had it picked up by the Target store chain and eventually saw it hit #1 on the New York Times bestseller list, #1 on the Wall Street Journal bestseller list and #10 on the USA Today list, in addition to becoming an international bestseller. A discussion of how Teresa came to live a more compassionate lifestyle, inspired by her beagles-one of whom was rescued from a pharmaceutical lab where he was the victim of animal testing, and the other of whom was used by a backyard breeder and then abandoned on the streets of Los Angeles with a cancerous tumor and riddled with buckshot. Teresa shares with audiences how through these dogs and her surprisingly humorous experiences rehabilitating them, she learned the many ways we unknowingly harm animals and ourselves, and what we can each do to calm the cognitive dissonance in our lives and live more compassionately-for ourselves and for the animals.